Your two-hour cruise from the heart of the French Quarter takes you back when cotton was king and life was slow and graceful as the current on the Mississippi. 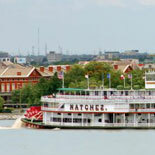 Enjoy lunch and let the authentic Steamboat NATCHEZ show you New Orleans, as it can best be seen, from the water! 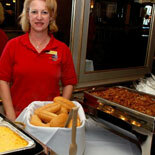 New Orleans Steamboat Natchez Lunch Cruise is a great way to enjoy 2 New Orlean's highlights-in-one ... New Orleans food and a cruise down the Mississippi River. 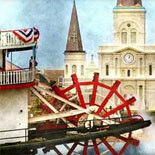 Since this is a real steamboat, you'll hear the beautiful music of it's calliope (a musical instrument powered by steam that is atop the steamboat) as you stroll through the French Quarter -- just follow the sounds to the river! She's the ninth steamer to bear the name NATCHEZ. It was her predecessor, NATCHEZ VI, that raced the ROBERT E. LEE in the most famous steamboat race of all time. Even today, the NATCHEZ is proudly the undisputed champion of the Mississippi, never having been beaten in a race. In many ways, she's the best of her line. It's a line that follows the course of river history, from the placid antebellum plantation era through the turbulence of the Civil War to the Gay Nineties, and ultimately, the new millenium. 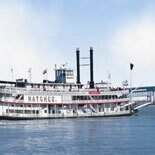 The NATCHEZ combines the best of contemporary construction, safety, and comfort standards with all the authenticity and style of her classic steamboat gothic predecessors. 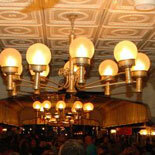 Enjoy an New Orleans' Buffet Lunch on the authentic Steamboat...The Steamboat NATCHEZ. 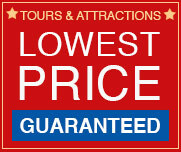 Get your eTicket today and cruise the Mississippi River on ..The Steamboat NATCHEZ! 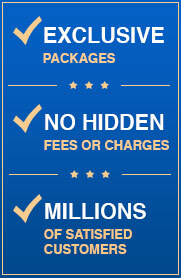 Let the Steamboat Natchez show you New Orleans! Closed Christmas Day, Thanksgiving Day, and Mardi Gras. Child Ticket: 6-12 years old. 5 and under ride free and their lunch can be purchased on board.